It’s been just shy of four weeks since the garden went in. I was about 7-10 days late planting out this year than I would have liked, and one thing I’ve learned about growing on the prairies is that timing is everything. When I was gardening on the coast you can fudge your plant out dates quite a bit – a week (or two) here or there doesn’t mean much ultimately, because the season is so long to begin with. But here, a week or two can change everything – half of the fruit ripening on the vines might be killed by frost. That extra week for the peppers outside could mean the difference between a great harvest or none at all. It can be a challenge, but it’s a fun challenge. Weather has just been all over the place, but it’s not entirely awful. We’ve had cycles of unseasonably high temperatures (28-31C), and then it’ll plummet to 15C and rain. Most of the plants seemed to actually be thriving under it, but I do worry about the night time temperatures not going down enough for when the tomatoes actually start fruiting (during the heat cycle we’re hovering around 15-17C at night). It does seem like a lot of the veggies are flowering in record speed. So much so that I had to snip a few flowers off the tomatoes because it was just too close to transplant and I didn’t want them diverting energy to fruiting when they were still establishing themselves. It’s been almost four weeks since transplant now, and I’m pretty confident that they’re good to start fruiting, so I’ve stopped clipping and will let them fruit from now on. 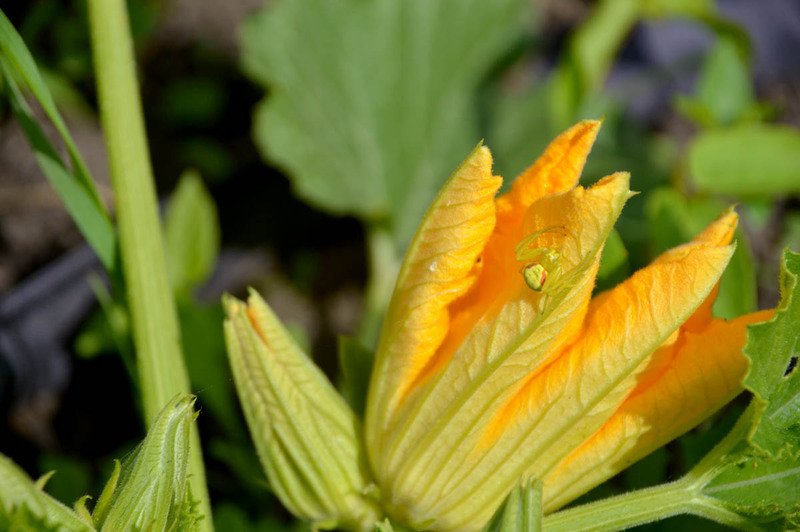 The ‘Fordhook’ zucchini and the ‘Fin de Meaux’ cucumbers are throwing off male flowers already, which is awesome. The zucchini looked a little stunted, but in the past few days they’ve really bushed up and are growing like gangbusters. The ‘French Fingerling’ potatoes are growing very well, but I’ve only had one ‘Caribe’ potato poke its head through the dirt. I’m convinced that is at least partially, if not entirely, because the bag I got from the grower had several rotten ones in it. I tried to pick out the ones that were rotten but I may have missed a few. I won’t be buying from that supplier again, which is too bad because they have a really nice selection. Vorlon – the one in the veggie garden had some curled leaves for a few weeks after transplanting. I’m thinking this is due to the several changes in temperature, going from chilly to super hot. The plant in the pot didn’t display the same issues. Halicz – Really extreme leaf curling and deformation, but that’s starting to seem to sort itself out. I’m positive this was transplant stress coupled with the wild swings in temperature. Even still, the plant itself is strong and I think it’ll be a good grower. Scotland Yellow – the extreme heat (30C) seems to stress this one out – although with lots and thorough watering this dissipates. This is a greenhouse variety from Scotland, so not totally unexpected that it’d react that way. Really fast grower though, and very sturdy. Pepper ‘Aji Chinchi Amarillo’ – seems to be a very slow grower, it’s being very quickly outpaced by ‘Morocco’ (which is doing fantastically). I’ll absolutely have to finish this one off in the house if it doesn’t pick up the pace. Tomato ‘Creole’ is hands down has my favourite tomato plant structure this year – I find the bushiness and the the way the leaves grow to be extremely pleasing to the eye. Cucumber ‘Fin de Meaux’ – is doing very well, in the very least for somebody who considers themselves unlucky with cucumbers. Bean ‘Morine’ – this one (along with the cucumbers and zucchini) I’m growing for Seeds of Diversity this year. I thought for sure the seed I got just wasn’t going to germinate, but finally they did! Out of 20 or so seeds I have six starts, which will definitely be enough to harvest seed from, and then I’ll grow out for quantity next year. Bean ‘Magpie’ – I only had six seeds, and none of them sprouted. I’m not too heartbroken, because it’s not an overly rare variety and I’ll be able to source more. Bean ‘Windsor’ – also very slow to germinate (old seed) but now they’re really growing like gangbusters. I ended up having quite good germination rates despite how slow they were to start. I can’t wait to see the flowers – they’re white with a touch of black. Tomatillo – this really is growing really well, and I’m so excited. I’m really glad I bumped into that fellow at Seedy Sunday and he let me know they do great here – I haven’t grown any since I moved from the coast where I was convinced the season would just be too short. Since they’re flowering already, my assumptions (thankfully) were wrong! Shallots – no signs of life yet from the seed shallots, but I’ve not given up all hope yet. If I don’t see any signs in a few days I’ll dig down and see what the problem is. Stay tuned for the next batch of updates – some will be longer, some shorter, but instead of leaving all my notes to the end of the year and uploading them onto the wiki, I’ll be adding them here as well as the summer progresses.